Tapeless production can mean a deluge of media cards - of many different varieties. Ingesting them all fast into an edit programme or into archive is key for a professional workflow. Nothing is faster or safer than the Qio. And with a built-in SATA controller, transferring directly into a RAID drive is the ultimate workflow. Fast - Uses PCI Express® bus interface to deliver superior performance; aggregate bandwidth of 200 MB/sec. Small and Rugged - Strong aluminum case measures just 5.9" x 6.2" x 1.22"
Sonnet’s Qio offers Mac and PC cross-platform compatibility, extending its usefulness on location and in the studio with an interface card or adapter designed specifically to connect Qio to the platform of your choice. 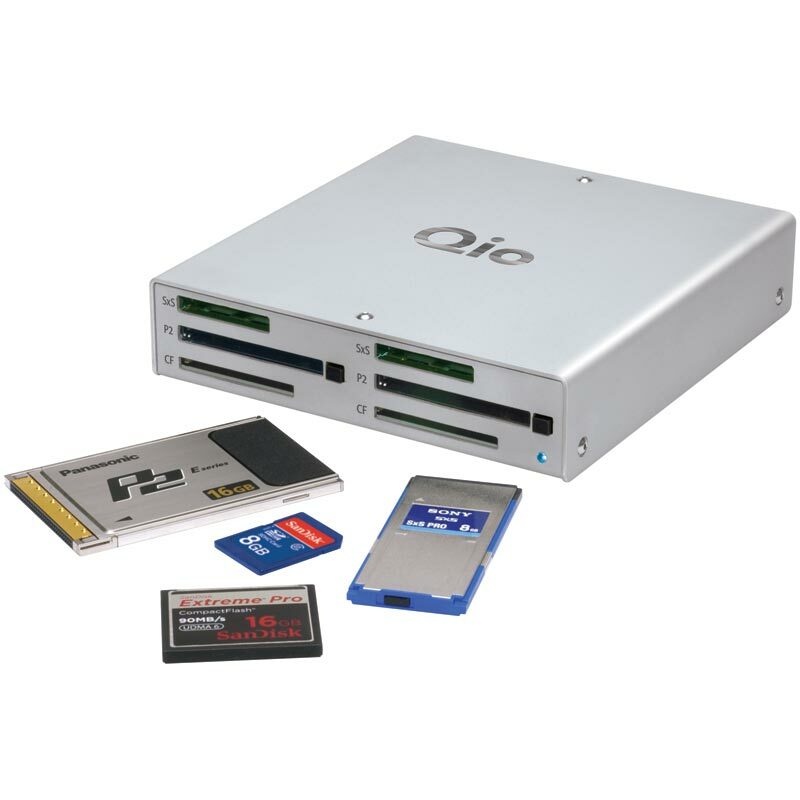 Whether you’re using a Mac® with Thunderbolt™ or Thunderbolt 2 ports, or a PC desktop with PCIe® slots, Qio fits seamlessly into your demanding production workflows. 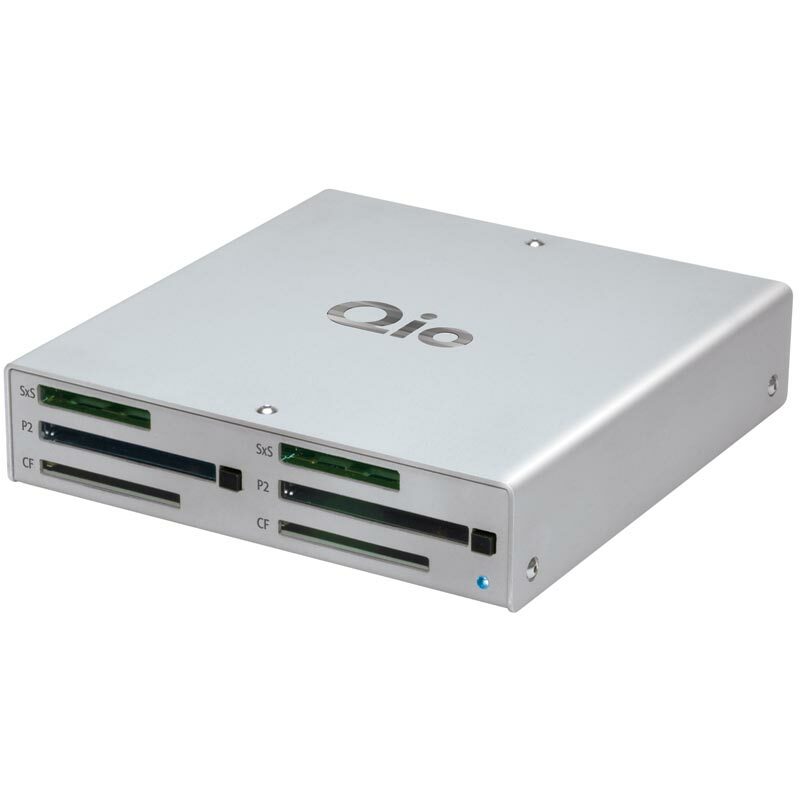 With the appropriate Qio interface card installed or adapter connected, you can move the Qio reader back and forth between a PC and a MacBook Air® or MacBook Pro® (or any other Mac with Thunderbolt ports). You can also migrate your Qio reader from a legacy Mac Pro to the new Mac Pro cylinder using Sonnet’s Qio Thunderbolt Interface Adapter Kit. The Qio pro media reader is small—about the size of three stacked CD cases—and takes up so little space, you can use it just about anywhere. It’s rugged too, the robust aluminum case easily withstands heavy use. This pro media reader even incorporates a slot for Kensington® and similar security locks to secure the device and deter theft.